Stories we read in the media often point to a divided, post-Brexit Europe, one of separation and difference. But what if this were only one side to the story? When you truly look in detail at every aspect of European life, you may find a more cohesive Europe than first appears. The Human Atlas of Europe provides a collection of striking, eye-catching visuals resulting from the use of new, state-of-the art mapping techniques. It is written by three leading international authors, Dimitris Ballas of the University of the Aegean, Professor Danny Dorling of the University of Oxford, and Benjamin Hennig of the University of Iceland. The book’s unique perspective comes from its presentation of Europe and its economy, culture, history and geography as it actually physically exists – that is, as a single large land mass, not as a collection of ‘nation-states’. The maps show key features of the actual experience of the people of Europe compared to other countries, regardless of the physical size of the country they live in. In this way, can the UK can still feel unity with Europe post-Brexit, by demonstrating that we are citizens of something larger than just our own country, united not just by common interest but by a shared commitment to common values and ideals? Can we remain “united in diversity”, as the EU motto says? “The publication of this atlas comes at a time when Europe is experiencing the worst refugee crisis in recent history, following a prolonged severe economic crisis and austerity measures. There has been an apparent revival of nationalisms and divisions, coupled with the rise of extremist and populist parties across Europe. However, these seem to have a disproportionately large influence on setting the policy agenda and media coverage and determining what is presented to us as a reality. 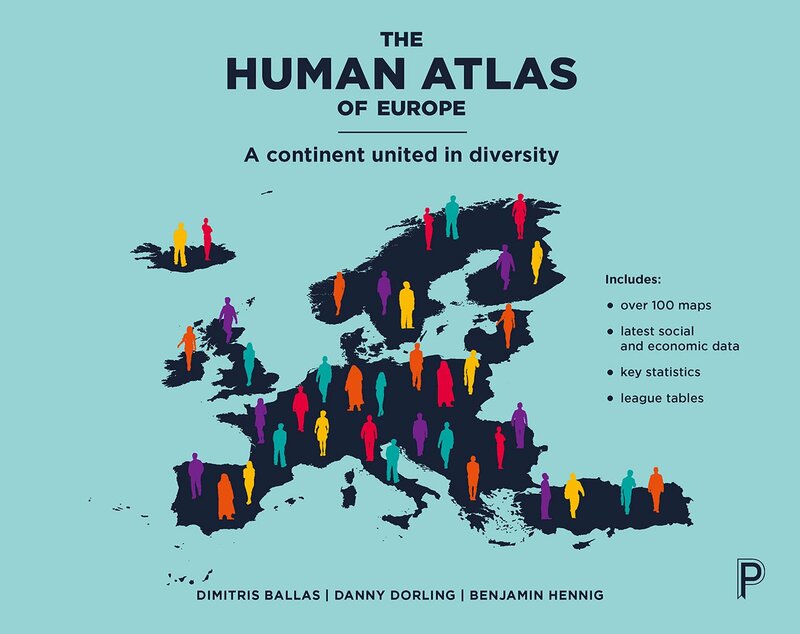 “Using innovative cartographic techniques, the atlas visualises Europe and its people in thought provoking way, and makes us challenge and rethink the way we see and understand Europe in the 21stcentury”. "An exceptional contribution to our understanding of who we are as Europeans. When we look at Europe from the outside, we find much more in common than divides us. This book traces the contours of those commonalities and brings them to life." The book is dedicated to Jo Cox (1974–2016), Member of UK Parliament for Batley and Spen, and in memory of all the refugees who have lost their lives trying to reach Europe in recent years. Dimitris Ballas (@dimitris_ballas) is Associate Professor in the Department of Geography at the University of the Aegean. He has published widely in the fields of Social and Economic Geography, Regional Science and Geoinformatics in the Social Sciences. Danny Dorling (@dannydorling) is Halford MacKinder Professor of Geography at the University of Oxford. His recent books include The 32 Stops: Lives on London’s Central Line and (with Bethan Thomas) People and places: A 21st centuryatlas of the UK. Over the last year, Dimitris Ballas has been engaged with refugee support through the Office of Displaced Designers (ODD) in Lesvos island where he has consulted on research and local community outreach strategy. He also led and convened three University of Sheffield Geography undergraduate student field classes to Lesvos island in the Spring of 2016 and 2017 which involved an effort to engage with the local and refugee community and to raise awareness about the refugee crisis, highlighting that safe passage and solidarity are key European ideals. This notion of Europe as a single entity is highlighted by looking at its physical and population geography simultaneously in new ways, using most recently available statistics, state-of-the-art Geographical Information Systems (GIS) and novel human cartography techniques.